Bainbridge resident Margaret Nevinski has published seven children's books, including Floating (2000) in which a little girl overcomes her fear of water, and Rainbow Wings (2000) in which Icarus' twin sister Iris follows her dream to fly. 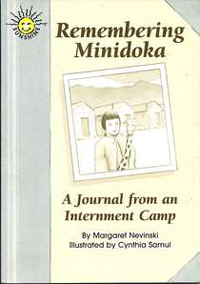 Perhaps Nevinski's most compelling book is Remembering Minidoka: A Journal from An Internment Camp (2001). In an interview with the Kitsap Sun the author reports that to get the book right, she did a lot of research and talked with Japanese-Americans on Bainbridge Island and Seattle about their experiences at Minidoka, a Japanese internment camp during WW II. "It's very important to me that I get not just the facts right, but also the whole feeling of what it was like to go to Minidoka. Bainbridge Islanders were the first to go there." Nevinski's books are published for the school market and distributed primarily to schools.